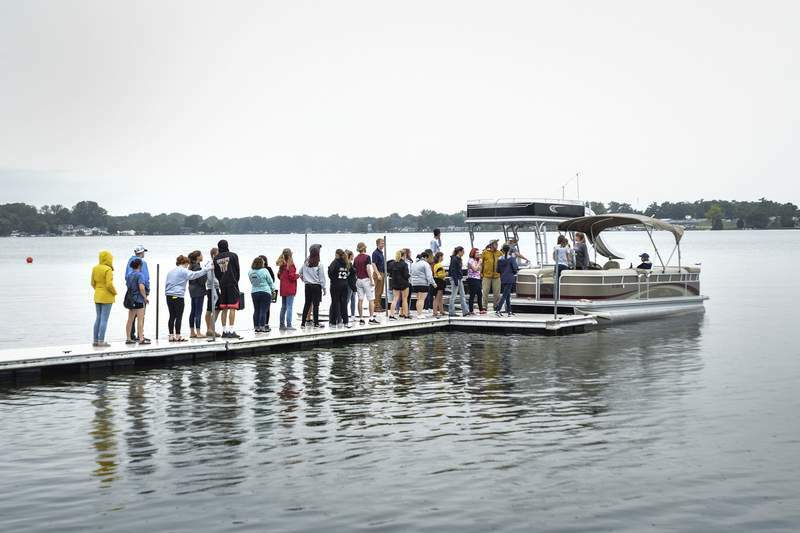 Photos by Mike Moore | The Journal Gazette Grace College students board pontoon boats to take samples on Winona Lake. ...the collection of much muck, but no bloodworms. 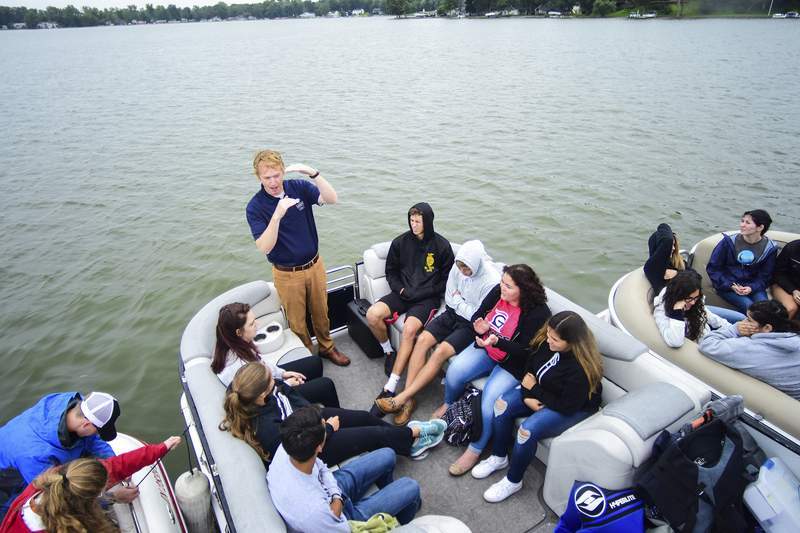 Mike Moore | The Journal Gazette Nathan Bosch, director of the Lilly Center for Lakes & Streams, addresses his students aboard a pontoon boat on Winona Lake. 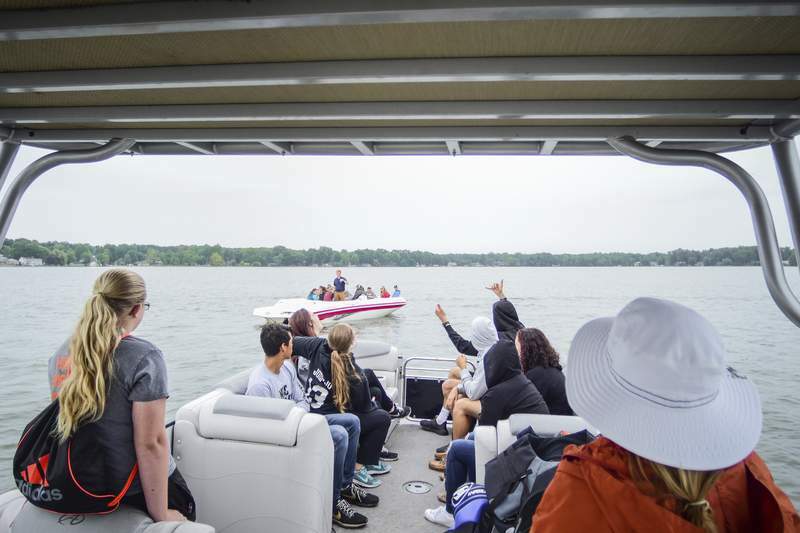 Mike Moore | The Journal Gazette Boats loaded with students from Grace College meet up on the deepest spot on Winona Lake to take samples and measurements during the Lilly Center for Lakes & Streams' Ecology 1 class. Mike Moore | The Journal Gazette Lilly Center for Lakes & Streams director Nathan Bosh lectures students of Grace College ecology 1 class about the different sedimentary layers beneath Winona Lake on Friday. Mike Moore | The Journal Gazette A student from Grace College filters through sediment from the bottom of Lake Winona. On a recent Friday afternoon, three pontoon boats converged near the middle of Winona Lake, at a spot where the water is deepest. Some of the passengers, all college students or younger siblings who had come along for the afternoon, clasped hands to hold the boats steady as others roped the vessels together. At the front of the middle boat, oblivious to a light but steady rain, Nathan Bosch addressed his class. As students pulled up hoods and fastened jackets, Bosch described what they would be doing in the next hour and a half and offered a quick refresher on things they had discussed in his class at Grace College. Bosch held up a series of gauges and buckets the students would use to probe Winona's waters and record and analyze the results. He reminded the students they would likely find the bottom layer of Winona, called the hypolymnion, would be cold water, with much warmer water in the top layer, known as the epilymnion. “Are those two separate, or are they mixing together?” he asked the class. “Our hypothesis is that they're separate – that right now Winona Lake is stratified into an upper layer and a bottom layer. So when we take measurements of both layers, we would expect those measurements to be different from each other, right? 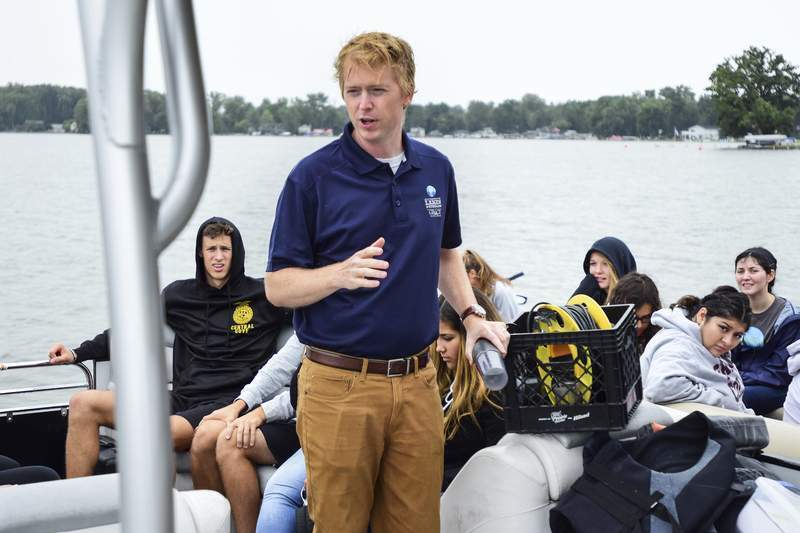 Bosch, who has been teaching this class for 10 years, is director of Grace's Lilly Center for Lakes & Streams, a research and education center aimed at bringing an evidence-based focus to the care of northeast Indiana waters. Housed in the Dr. Dane A. Miller Science Complex, the center has seven full-time and three part-time staffers, and 25 paid student interns. During the summer, it conducts weekly samplings at 14 lakes in Kosciusko County. The center also samples, every two weeks year-round, 14 streams that feed into lakes. “These are the best-studied lakes in the state,” said Abby Phinney, the center's communications specialist. Helping protect lakes and streams in the Warsaw area and training students who hope for a career in such research are two key goals. The center is also part of a growing effort to raise consciousness statewide of the need to protect our water resources. In a poll taken for the nonprofit Nina Mason Pulliam Charitable Trust last year, 90 percent of those surveyed said they were very concerned or somewhat concerned about pollution in Indiana's rivers, lakes and reservoirs. A 2014 report by the Indiana Chamber of Commerce noted that the Indiana economy is unusually dependent on water availability. Though it noted the state has been blessed with plentiful water, the report predicted our growing economy could increasingly strain ground and surface water supplies and called for serious commitment to a statewide water resource plan. Based on the economic worth its lakes bring to Kosciusko County, Bosch said, the center estimates lakes statewide have a $5 billion economic impact. “It's similar to agriculture in northeast Indiana,” Bosch said. The Lilly Center is doing what Phinney said is a major study on how to control blue-green algae, which produce toxins that can be harmful to pets or humans. (A blue-green algae bloom in Lake Erie left half a million residents in the Toledo area without drinking water for a short period in August 2014.) The center is also studying the relative effects of sewer and septic systems on lakes. 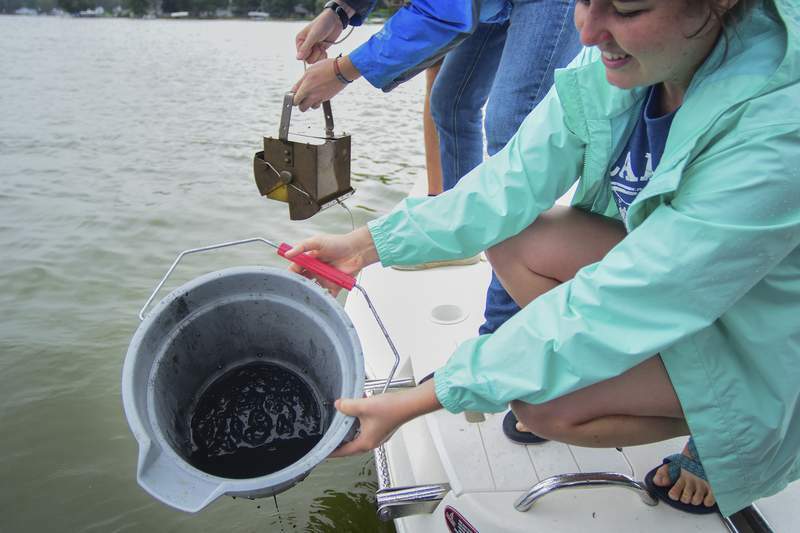 Two students raised a bucket designed to take samples from sediment at the bottom of the lake, 80 feet below. As the day before, there were no bloodworms. “It's got me a little bit baffled,” Bosch said. “I'm not sure what that's due to. ... It could be good news if it means there's oxygen down there ... bloodworms do their best when there's low oxygen.” But it could be bad news for the lake if the oxygen level was too low even for bloodworms to survive. A $5,000 piece of testing equipment Bosch called a Quanta proble might offer some answers by providing readings on temperature and oxygen levels. 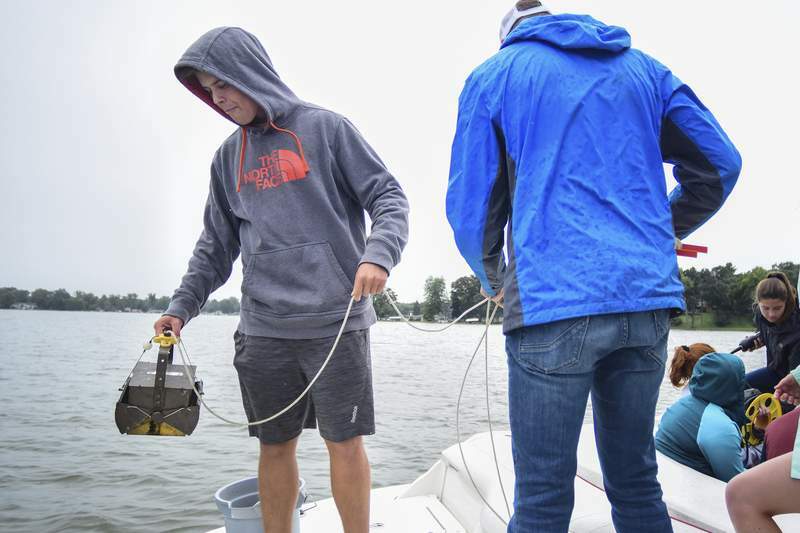 Bosch assigned four students to shepherd the meter – “We don't want it to end up on the bottom of the lake,” he said. One student lowered the sensor through 80 feet of water while another held the cable. One held the sensor's display unit, and a fourth student was in charge of writing down the data. It was worth the effort. The students found there was only enough oxygen for fish to breathe within the top 15 feet of the water. As the session wound to an end, Bosch addressed the whole group again. “Phytoplankton?” one of the students offered. No, Bosch said, the microscopic algae actually make oxygen. The oxygen, he explained, likely is being consumed by decomposing vegetation that has grown to be 46 feet deep at the bottom of the lake. “Leaves and weeds and bad algae – all that stuff sticks to the bottom,” Bosch said. “They are using up oxygen.” The lake, he said, was once 125 feet deep. Two hundred years ago, before that layer of muck settled at the bottom, sturgeon and other coldwater fish could survive there, he said. But no longer. So the students this late-summer afternoon got a sense of how lakes evolve and how natural cycles and unnatural pollution could make a lake eventually change – or die. And the class was left to ponder the riddle of where the bloodworms had gone. In an email this week, Bosch said students had since found bloodworms in Cherry Creek near where the creek feeds into the lake, which may only add to the mystery. The course that had Bosch's class braving the rain is part of an environmental science program the college launched in 2008. Many students take it just because it's interesting. 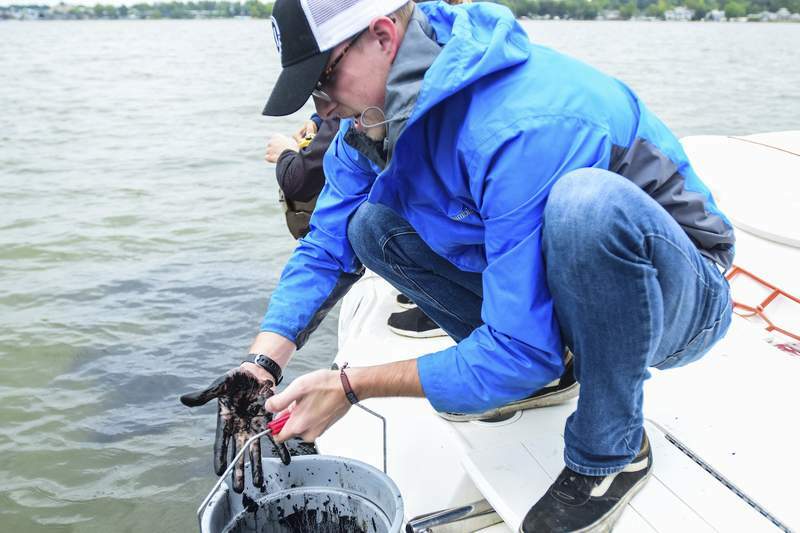 But Hayden McCloskey, a 20-year-old third-year student from Fishers, was attracted to Grace by the environmental science program and hopes to become a professional researcher. “I might work for a fishery or stick with the nonprofit career with water-monitoring,” McCloskey said. Bosch, who was her adviser when she arrived, told her about the Lilly Center program and urged her to become an intern. McCloskey was not one of those aboard the boats that Friday, but she said in an interview the field research was her favorite part of environmental studies. “I always had a passion for water,” she said.